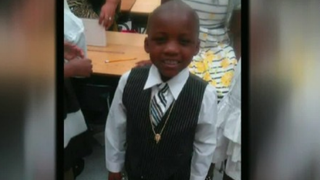 A 6-year-old Florida boy was killed Saturday afternoon after two men began shooting as he was outside playing with friends. According to Local 10, King Carter and friends were playing in Pinewood, Fla., just north of Miami in Miami-Dade County, when "two unknown black males exited a dark, four-door sedan and began shooting, striking [King]. The gunmen and driver then fled the complex in the vehicle in an unknown direction," the Miami-Dade Police Department said in a statement. King was rushed to a local hospital, where he later died. "Clearly, he's not the target. He happened to be an innocent bystander, outside playing, doing what kids do," Miami-Dade Police Director Juan Perez told Local 10. "I'm angry. Our officers are angry. The community behind me's angry, so hopefully they're angry enough that they could provide some information that will lead to the arrests of the individuals." King's father, Santonio Carter, recorded a video outside the hospital, asking friends to pray for him after learning that his son had died. "Just lost my son, 6-year-old King Carter," Santonio Carter said on the video, which he posted to Facebook. "Y'all seen me with him every day, man," he said, before decrying the gun violence and "[n—gas] doing dumb [s—t]" in his community." Santonio Carter, who also lost a teen brother in an accidental shooting in 2003, told Local 10 that he is tired of violence in the community and people being afraid to speak up when tragedy happens. "It's so easy to get a gun. It's cowards. … Where the real men at?" he said. "They're missing their daddies, and my son had a daddy and his daddy's standing here before y'all, fed up." Family members described King as a joyful boy who loved sports, especially football, as well as cartoons, especially Teenage Mutant Ninja Turtles. "If you know what happened, please say something," King's aunt Tawana Akins said during a news conference. "A 6-year-old—just think of your life at 6. It could easily be your family next."